Just imagine you could help others every time you wash your hands or do the washing-up. 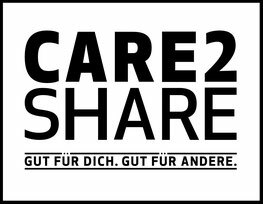 Thanks to care2share, you can: we combine the culture of sharing with the consumption of everyday goods, in this case high-quality toiletries and household care products. Our first product is a vegan liquid soap with all-natural ingredients. A fixed proportion of the proceeds from every bottle sold is donated to local social projects. Good for you. Good for others. We believe in the culture of sharing. A fixed proportion of the proceeds from every product is donated to local social projects. care2share is guided by a belief in transparency and partnership. We regard our customers and staff as like-minded ambassadors for the culture of sharing. Our company’s activities and figures are disclosed openly in accordance with the Social Reporting Standard. We provide high-quality products. We only use ingredients with a certificate of approval for natural cosmetics or organic products issued by recognised institutions. Logistics and packaging materials are under constant review in order to reduce the environmental burden even further. We focus on long-term, sustainable solutions. We want to stimulate a more conscious consumption of fast-moving consumer goods. We plan to make refill and subscription concepts an integral part of our business model. The aim of the company is to provide long-term support for selected projects and organise itself in such a way that more of our profits can be donated to good causes. The first local initiative we have chosen to support is the Street College of the charity Gangway e.V. in Berlin. Gangway e.V. has been engaged in low-threshold social street work in Berlin for some decades. The “Street College” offers young people an opportunity to develop their talents and realise their dreams beyond the scope of conventional education and training. Additional projects are planned at a later date.